Spring is in full force, and what better way to melt the winter away than with a space filled with warm woods, rich fabrics, and golden detail? When a Chicago pair decided to update their historic condo, they dreamed of a dwelling that felt classic, yet modern; warm, yet clean. We curated a space derived from detail with an elevated sophistication that speaks to their love of both modern and classic styles. The original kitchen’s outdated and yellowing color pallet - as well as the millwork and finishes vocabulary - were reminiscent of a classic suburban Tuscan-style kitchen. While the space should have felt expansive based on its square footage, the dust-collecting cabinet trim and bulky pendant light created a complicated and cluttered feeling. There were no visual queues that referenced the condo’s historic Art Deco heritage. The clients’ wanted a completely renovated kitchen that was illuminating, modern and functional; yet reflected the building’s Art Deco roots of the early 1920’s. We crafted our design around the clean white cabinets, refreshed ceiling, and brightly polished porcelain floors – all intended to maximize and reflect as much light as possible. The rich, black granite creates a dramatic contrast while the kinetic movement of its veins adds mesmerizing interest. We decided to add warmth to the already luminous space by incorporating walnut at the island and range wall. We further distinguished the island as a piece of furniture, detailing it with a beautiful tambour fascia, a reversed beveled edge at the counter top, and outfitting it with a functional and stylish brass foot rail. 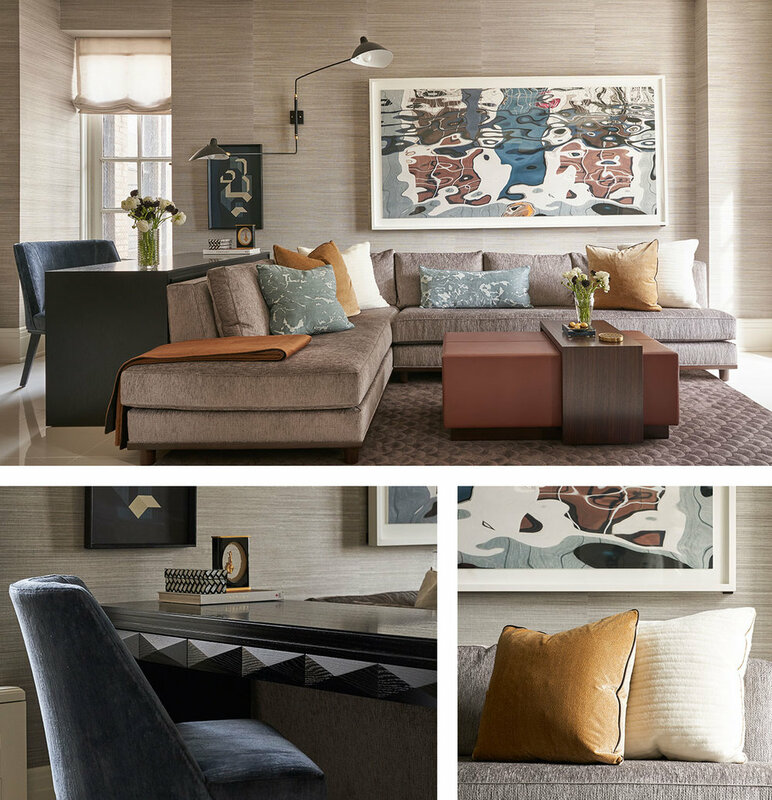 To balance the space, we introduced bold and geometric Bauhaus art pieces that reinforce the nod to old world glam. Similar to the problems found in the kitchen, the clients’ existing living room furniture and finishes were a vestige of their former life in suburban Chicago. These fluffy, over-sized elements no longer fit their new lives as an urban, streamlined duo. Our goal was to elevate the sophistication of the space by introducing a variety of luxurious textiles and finishes while eliminating the extraneous elements that visually clouded the area. To reinforce the classic Art Deco spirit, we introduced an elegant fan motif in the area rug as well as slightly metallic, golden tonal textures in the upholstery. The layered grass cloth wall coverings add a richness to the room while the over-sized art adds a compelling contemporary twist. The clients’ wanted the area behind the sofa to act as a home office, so we introduced a sleek, sculptural lamp which reinforces the functionality of the desk space. The geometric facets of the black desk drawers evoke the graphic Bauhaus art used in the kitchen.